Lance’s greatest strength is experience, having worked in the construction industry since 1973. 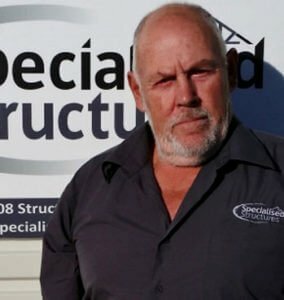 And, having lived in the Tasman area since 1980, he has a good understanding of what’s involved in putting up a building to withstand local conditions. Owner of the Cluster Construction Group, a network of construction industry providers, Lance has provided management and construction services spanning several different projects and industry types, from civil works and commercial/industrial builds through to residential builds and alterations. He joined Specialised Structures specifically to add customised commercial building solutions to his repertoire, but also enjoys the diversity of Specialised Structures as well as the engineering and design included in a Specialised Structures building. Lance prides himself on prompt, personal and professional service.